Chantelle Gabino is a one-of-a-kind fixture in Toronto’s restaurant and beverage industry. She is an Ambassador from Bittered Sling and Bartender at Mersey Cross and The Drake. Not only did she create the “Cambiar” cocktail and win the regionals for 2019's BACARDÍ Legacy, but on February 3rd, she’ll be in Puerto Rico to compete in the national final! This world-wide cocktail competition challenges bartenders to each dream up a BACARDÍ rum drink with the “greatest potential to establish itself as a classic and join the pantheon of BACARDÍ® Legacy cocktails alongside the Mojito, Daiquirí and Old Cuban before it”. A tall order, indeed. But, look who’s done it now! ToFoodies: What is the Cambiar? 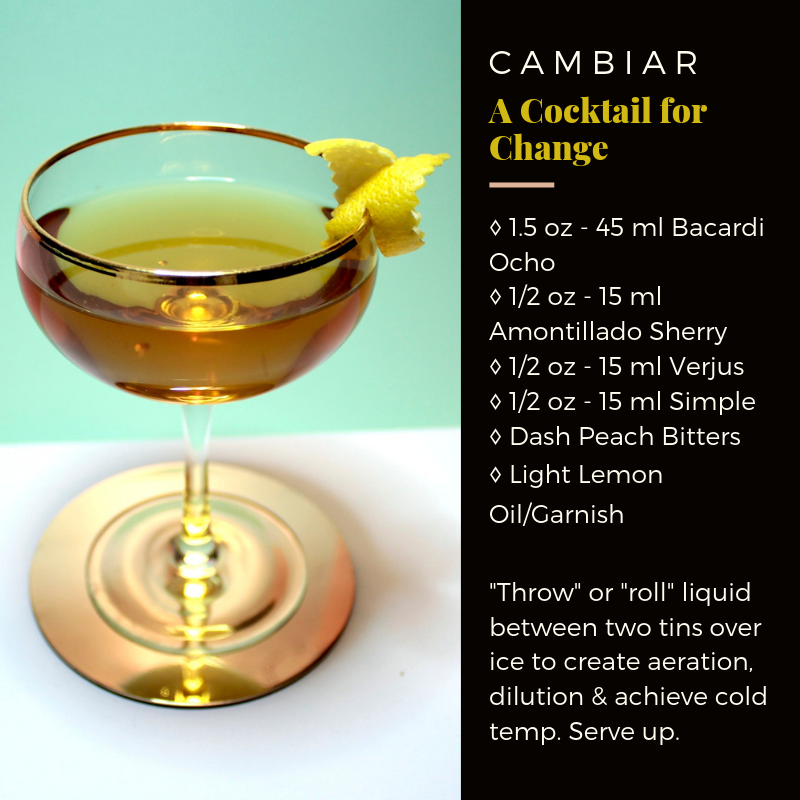 Chantelle Gabino: A cocktail for Change (Cambiar means "to change" in Spanish) is a cocktail I created for 2019's Bacardi Legacy. In an effort to support and instigate change in our community, I ask that $1 of each cocktail be donated to a charity of your choice. I have been advocating for the Dandelion Initiative. Choose whichever charity speaks to you. This is not a demand, but a kind suggestion. TF: What was the inspiration for the drink? CG: The ingredients of the cocktail signify evolution, change and growth while paying homage to the legacies of the Bacardi Family and those of my own. TF: What are you most excited for about the competition in Puerto Rico? CG: I'm excited for the possibility to instigate change by creating a narrative with Cambiar of togetherness, support and positivity within our community. I believe that Cambiar, if it moves to the Global Final, can help to send an impactful message during this pivotal moment in our History, especially when addressing political, socio-economic or environmental views within the hospitality industry. TF: Any advice to up-and-comers hoping to do what you do one day? CG: Do your research. Always be a sponge, ready to soak up any and all information. Don't be afraid to fail; it's the most effective way to learn. Surround yourself around people who inspire you, and be kind to everyone. ***A note from Chantelle: Added garnish is a Cerignola olive if you wanna get fancy. The pairing is like whoa. And check out @makeacambiar on Instagram for more info around the concept and ethos of this glorious drink!